Ansonia Clock Company "Crystal Palace No. 1 Extra", C. 1880. 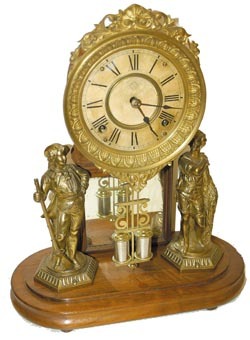 Clean top to bottom, everything original under the glass, dial, pendulum, statues, 2 piece paper dial. The glass dome is a contemporary replacement, several tried until one fit just right. 18" high, including the dome. The mirror is showing a little age, but that is good, at least we know it is original. The walnut base is clean and shining, all the metal is clean and bright. 8 day time and strike movement is running very strong, strikes on a nickel bell. Stands 16.5" plus the dome. Ly-Ansonia, page 240.